The White uPVC Duratech windows boast a tough, durable plastic frame white a steel centre core for extra strength. Aesthetically pleasing, these strong plastic roof windows work brilliantly in any room, but are a firm favourite in kitchens and bathrooms. The wipe clean polyurethane coating is the perfect option when it comes to humidity or condensation problems; any smoke or dust is also easily cleaned which means the range requires little or no maintenance. Like all Duratech windows the APX range comes with a free 10 year manufacturer guarantee, leaving you rest assured that youâ€™ll have nothing to worry about once installed. Centre Pivoting with an elegant handle positioned at the bottom of the window. White Upvc frames combined with a strong steel centre core. 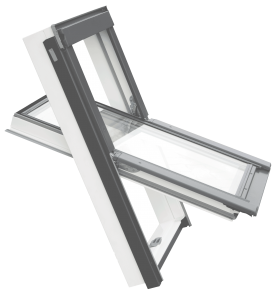 Double glazed units are filled with argon gas to maximize u-values and noise reduction.